You are here: Home / Shop / 45 amazing gifts for those who love baking! 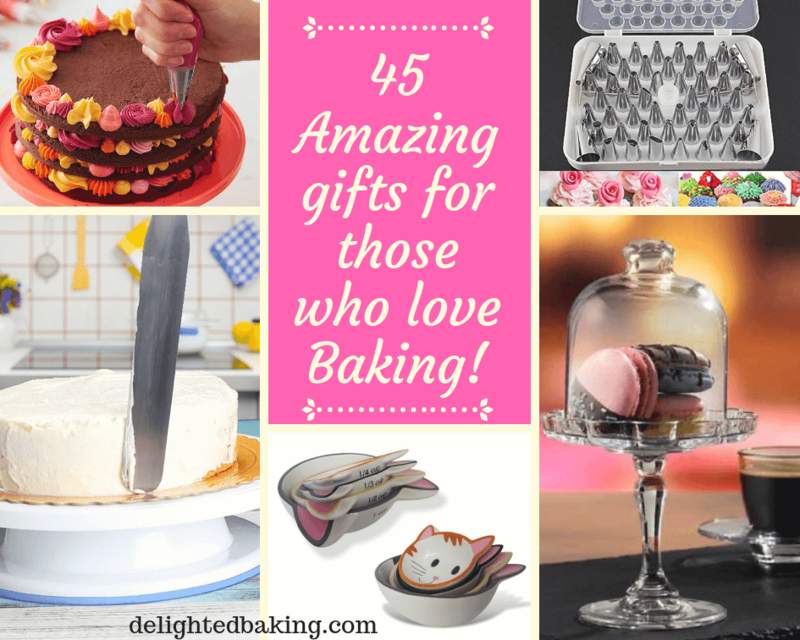 Amazing gifts for anyone who loves baking – Chosen collection of gifts from a baking enthusiast. Who loves to receive gifts? I am sure everyone loves gifts. Gifts whether handmade or ready-made, they are special. Gifts are an important part of memorable events – Birthdays, anniversaries, friendship day etc. ; all are incomplete without gifts. As this blog is related to baking, I thought of publishing a collection of best gifts for the bakers. This collection of gifts is perfect for beginner bakers as well as those who are an expert in baking. I have carefully chosen the gifts listed below, so if you decide to buy any of these, be assured that the person who will receive this gift would love it. I have divided this collection of gifts into 4 sections. I have done this to make it easier for you to choose the gift. For example, may be the person (who you want to give this gift) has just started baking, then it would be better if you choose a gift from either Basic tools for baking section . As the person has just started baking, he/she will need these basic baking tools and if you can give these (as a gift), I am sure he/she would love it. Let’s see another case : May be the person for whom you want to buy these gifts love reading and collecting cookbooks. Then you can look for his/her gift in the Baking Cookbook section. Although, you can look in all the sections, as you know the person better. Please note that some of the links below are affiliate links, and at no additional cost to you, I will earn a commission if you decide to make a purchase after clicking through the link. 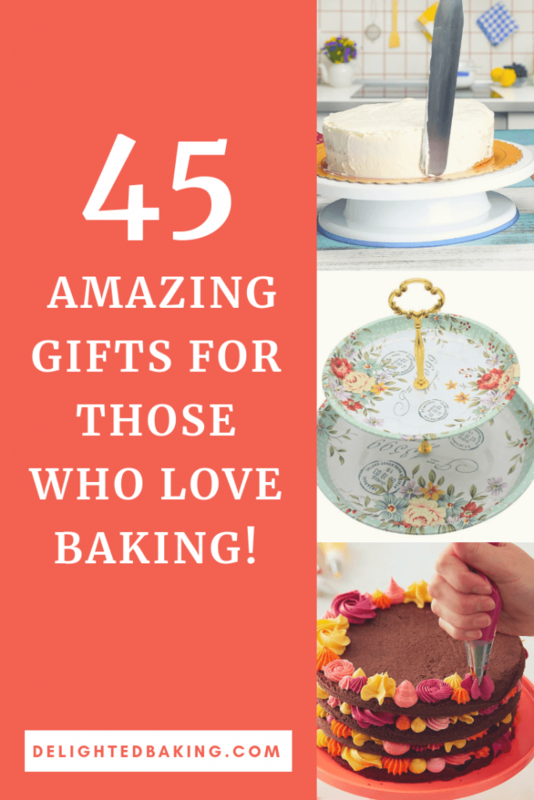 This collection of gift is perfect for beginner as well as the expert bakers. Baking requires a lot of tools and equipment (if you are a consistent baker). Thus these gifts are perfect for baking enthusiasts. Cake tins are probably the most essential equipment for baking. This is a very nice gift for any person who likes baking. It is also useful for the person who has just started baking. The person would love to have not one, not two but three cake tins as a gift. This set consists of a round shaped cake tin, a hexagonal cake tin and a heart shaped cake tin. Every baker needs a loaf pan. A loaf pan is needed for baking loaf cakes. It is also important for baking breads. You can even prepare homemade ice-creams in a loaf pan. Maybe the person has the basic round and square cake tins. Receiving this loaf pan can help her a lot in her baking experiments. Cut the grease and extra calories of deep fried donuts by baking them instead in this Nonstick Mini Donut Pan. The pan makes 12 mini donuts that are 2 inches wide. The durable nonstick coating helps ensure effortless food release and clean up a breeze. Hand washing recommended. If the baker loves to bake donuts, then this a cute and useful gift option. Even if the person doesn’t bake donuts currently, you can gift his mini donut pan, encouraging her to try donuts recipes. Gift this cute apron set to anyone who loves baking. Don’t forget to ask for a homemade cake in return :P. This set consists of a cute apron, a kitchen towel and oven gloves. It’s every baker dreams to buy a stand mixer. And , I am not joking. A stand mixer reduces baking preparation time as well as saves manual labor. This is the best gift for a person who loves baking. This stand mixer helps in preparing cake batters. Instead of whipping butter and sugar with hand, you can whip them using this stand mixer. Instead of kneading bread dough with hand, you can do this with this stand mixer. Just add all the ingredients ,one by one, and start the mixer. It will knead the dough (as required for the recipe) in a short amount of time. Kneading a dough requires a lot of hand work. The arms start paining sometimes. Thus, this is a very practical gift. If you are tight on a budget and still want to give a useful gift, then you can opt for a hand mixer instead of a stand mixer. It does the same work and it’s a more budget friendly option. 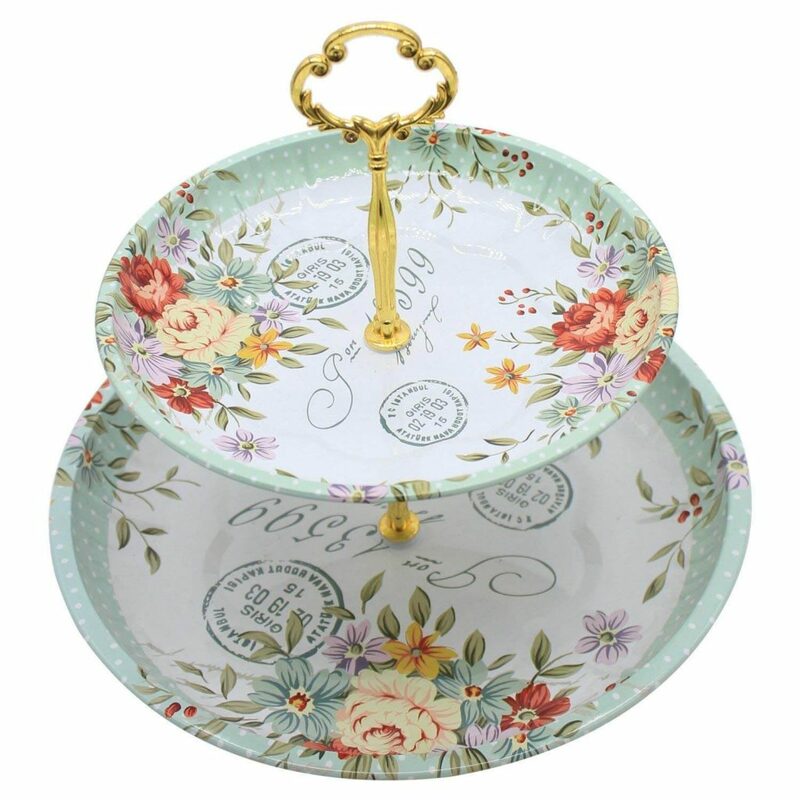 This bake and serve or bake and gift loaf cake tin is also a beautiful gift. This set contains a total of 25 such cake tins (along with lids). This would make it easier for the baker as he/she can bake in this and can later on gift this to his/her family and friends. Apron, oven glove, pot holder, kitchen towel, chef cap set. If the person for whom you are searching for gifts loves beautiful, good looking and classic bake ware, then this section of gift section is perfect for you. I personally love this section of this collection the most. I love beautiful cake tins, cake stands, mixing bowls, serving plates etc. If you want to gift something unique and beautiful, then these are perfect! Look at this cake tin below. It’s gorgeous , isn’t it? You can gift this beautiful cake tin and believe me, the person will love this. This cake tin bakes beautiful looking cakes. These cakes are elegant and can be gifted to someone as edible gifts or they can be served as the main dessert during a party . Well, preparation is an important part of baking. Whether the baker is mixing various ingredients for the cake batter or preparing a dough for her favorite chocolate cookies, right preparation is the key. And when you have beautiful colored mixing bowls like these, baking becomes more fun. The mixing bowl set is crafted from durable melamine and designed with a rubberized base for stability; top-rack dishwasher safe. Each mixing bowl has a helpful rim handle on one side and a pour spout on the other for pouring out delicious batters. A turn table is an important equipment for those bakers who decorate cakes with whipped cream/buttercream. The cake is placed on this movable table and is then covered with frosting. This rotating turntable allows you to freely turn your cake with ease, allowing for easy piping, smoothing and decorative touches. The turntable features full 360 degree rotation clockwise or anticlockwise. The raised platform provides unrestricted access to all areas of the cake and ensures the cake can rotate free from obstructions. The rotating base also features circular markings to ensure the cake is perfectly centered. The smooth surface is easy to clean. The rotor is more stable to control the time and rotating speed. Another classic from Nordic Ware. This cake tin bakes beautiful cakes. The baker will definitely like this gift. 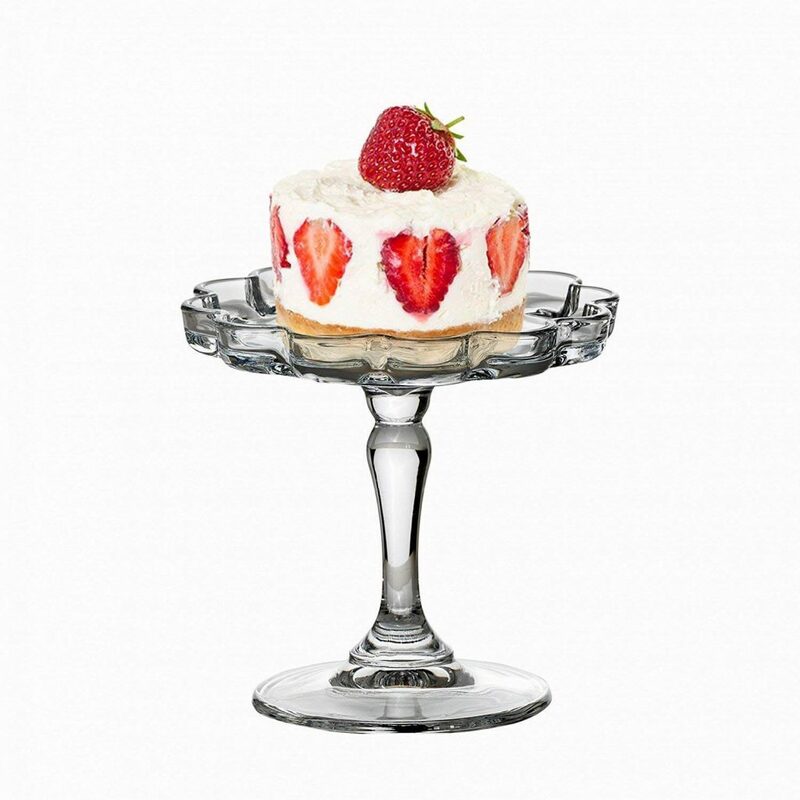 This Cake stand is stylish, strong, durable and a nice addition to any situation. 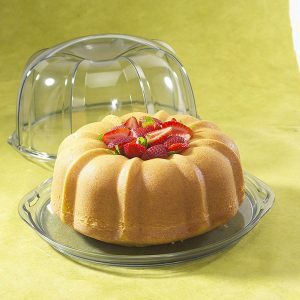 KEEPS FOODS FRESH – The domed cover keeps food fresh and clean for hours. Perfect for cakes, pies, pastries, fruits, vegetables, garnish and much more. Cake keeper for keeping cakes fresh. Crystal-clear exterior displays cake inside. Beautiful cakes should be served/kept in beautiful cake keepers like this. Cake keeper helps in keeping the cake fresh and clean. It is quite an essential product for bakers. They can bake the cake a day before and can keep it in this cake keeper. The cake can be served the next day. Even if you are serving the cake during a party, you can keep it in this cake keeper. A beautiful cake tin by Nordic ware. 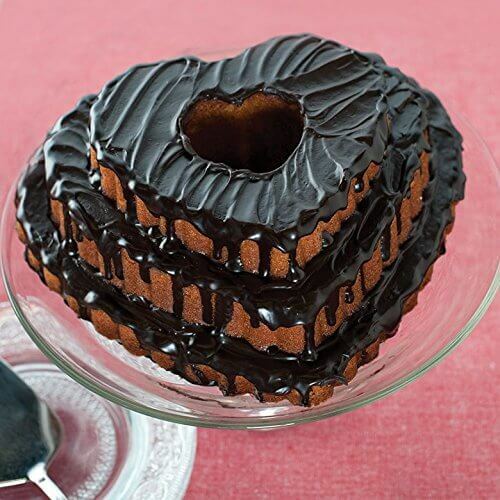 This bakes a tiered heart shaped cake. 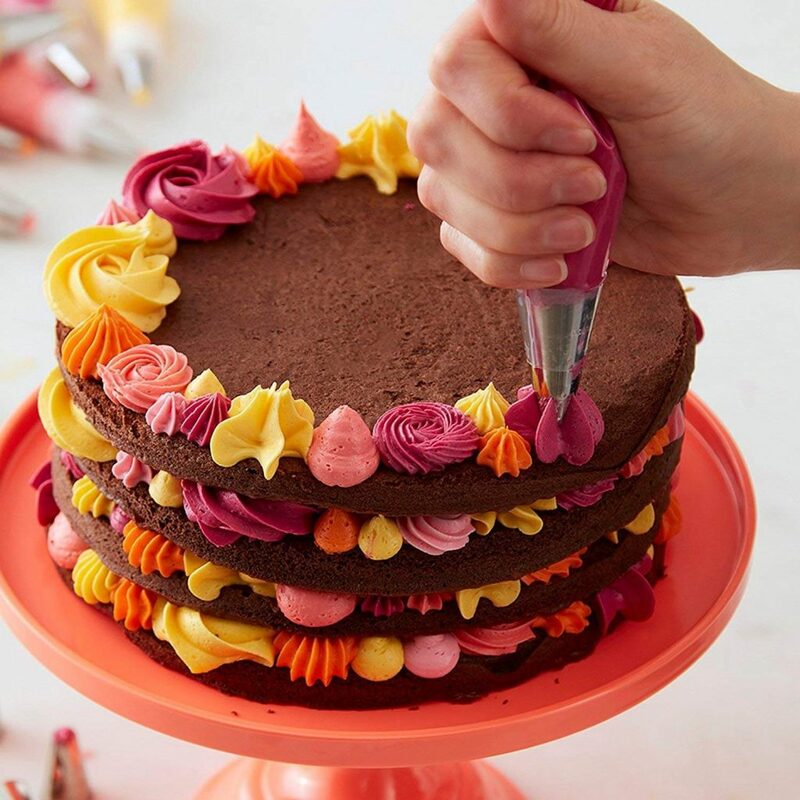 The baker can decorate the cake using ganache or a simple glaze. As I said before, loaf pans are important for every baker. So, if you are thinking of gifting a loaf pan, then here’s another good option. This loaf pan is perfect for beautiful presentation of the cakes and breads. Again, loaf cakes baked in this pan are ideal gifts. Generally the person who bakes uses simple shaped cake tins – round or square. Thus, receiving such a beautiful cake tin would definitely make them happy. If the person (for whom you are looking baking related gifts) also like cats, then this is the perfect combination. 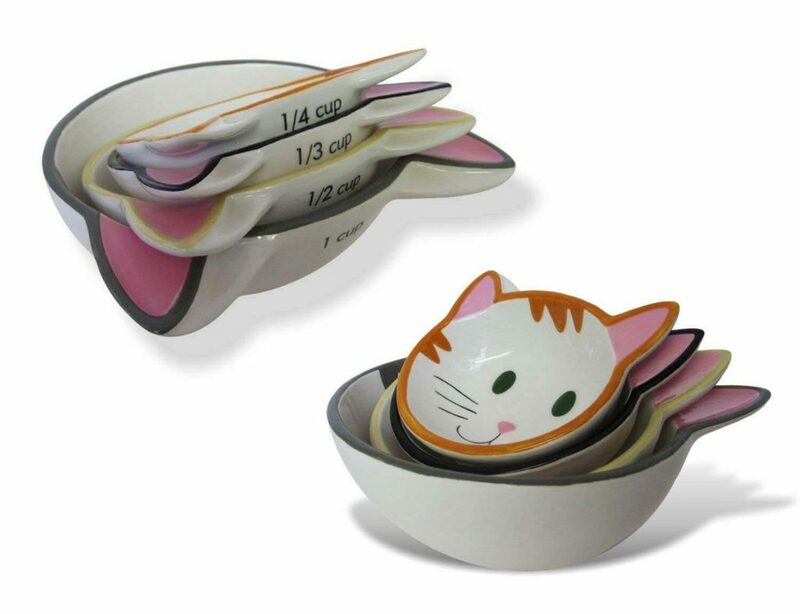 These cute cat shaped measuring bowls and spoons are easy to use. You can also use these as serving bowls. Kids would definitely love these. 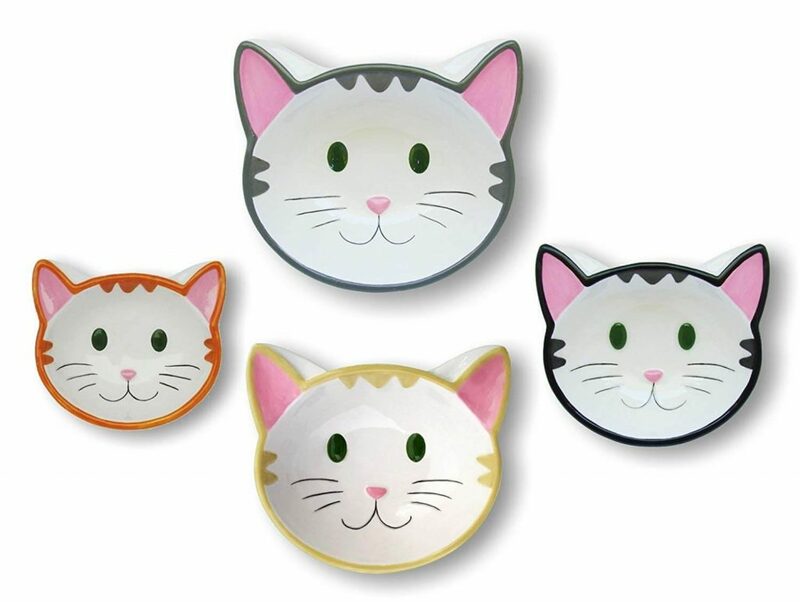 Perfect baking related gift for cat lovers. 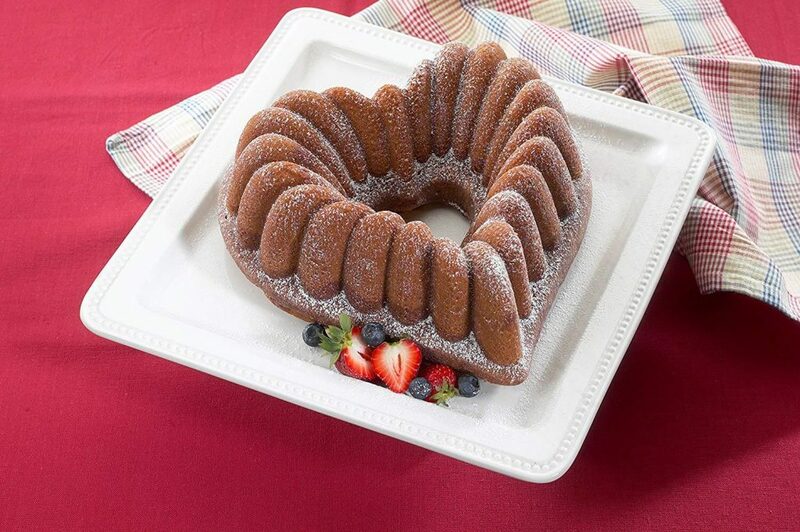 Serve up the sweetest treats in this adorably Lacy Doily Cake Stand. Ideal for parties and get-togethers, you’re sure to wow your guests with this masterpiece. Wipe with a dry/damp cloth to clean. This is a beautiful gift for the baker as she can serve her home baked cakes in this beautiful cake stand. DISPLAY YOUR CUPCAKES: This cupcake stand features a vintage design. This stand can hold 24 cupcakes / muffins and stand can be adjusted so it can hold your cupcakes perfectly. The stand is easy and quick to assemble. EASY CONSTRUCTION:This cupcake stand can be put together in an instant. Simply screw the tiers together and tighten them. Once you have used your stand, it can be stored effectively by unscrewing the stand. SHABBY CHIC: The white coating in metal gives a classy finish to the tiered cupcake stand. 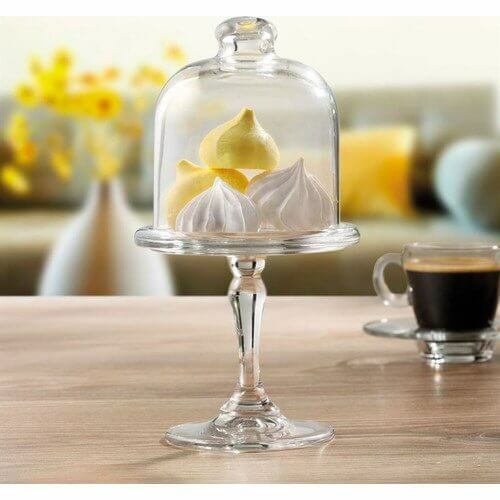 The delicate design will make your afternoon tea delightful. 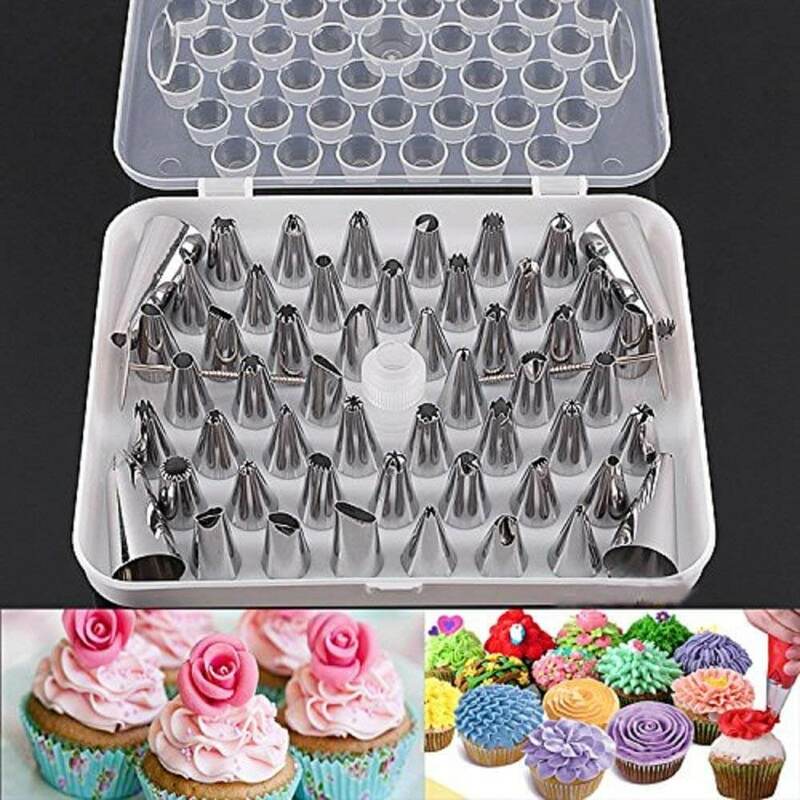 It’s decorative and unique design will keep your cupcakes safe and sturdy in the stand until it’s time for them to be enjoyed! 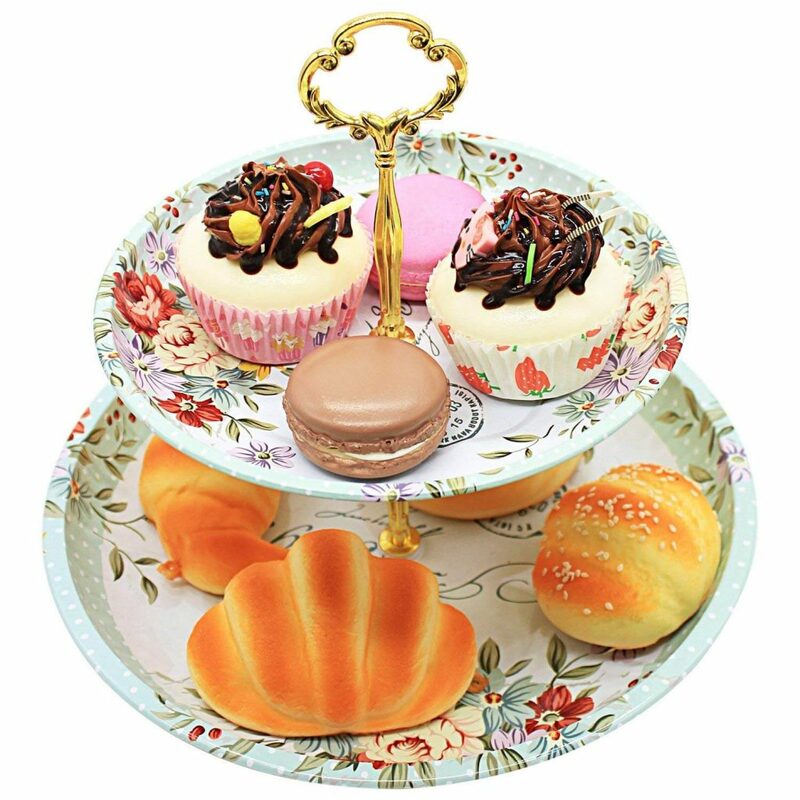 Package: Beautiful and fashionable round shape cake stand and golden metal rod, can elegantly showcase cupcake, snacks, dessert, brownies, finger foods, party appetizers at your birthday party and wedding party. Occasion: This elegant cake stand will be a perfect match with your dinner table at your tea party, wedding party as well birthday party. Design: Unique golden metal rod and floral embossed platters. Gilded decor update the style of cake stand. Each platter has a complicated but nice emboss. The guests will be surprised with your enthusiastic treat. Easy to clean and store: These sturdy metal plates and stainless ceramic stand convert from a 2-tier tray with handle masterpiece to a stack-able and easily cleanable serving kit ready for any cupboard or cabinet. If the person (for whom you are looking for gift) enjoys decorating cakes and cookies, then you might find a good gift in this section. Well, this is one of the best gifts in this section. This is perfect for those who are just starting cake decorating or say are still newbies. This set contains 1 Cake turn table , 1 smoothing spatula, 5 nozzles tips, 1 reusable icing bag, 1 buttering oiling brush, 1 spatula. 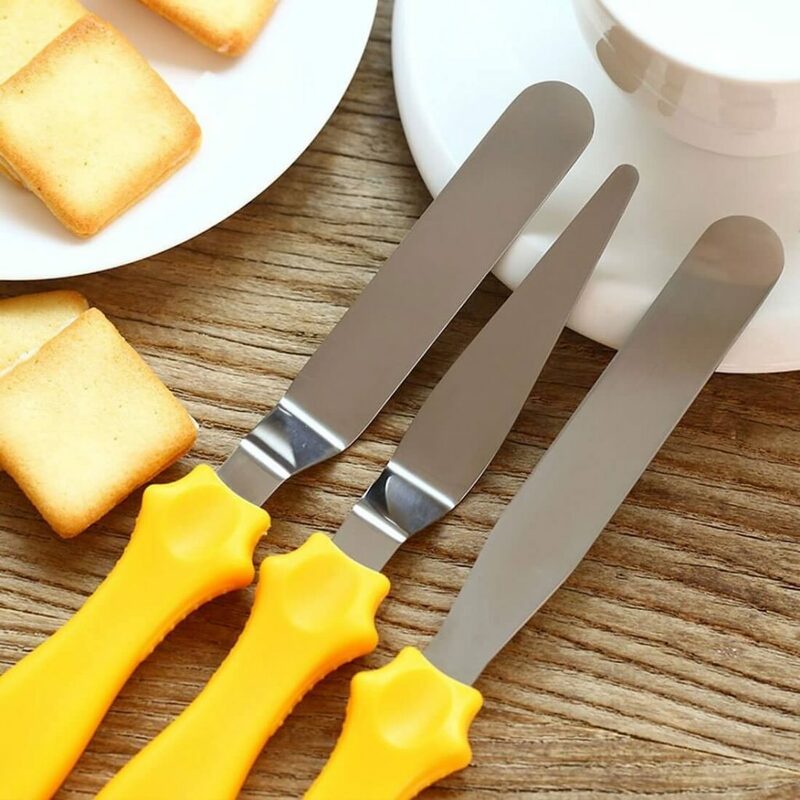 These are the basic cake decorating tools that a beginner cake decorator would need. Although oiling brush is not needed for cake decoration but it is useful for greasing cake tins. The set consists of a cake stand for decorating cake with full easy and comfort, rotating 360 degrees, turntable allows you to easily decorate the cakes, ideal for icing, borders, combing, leveling and other decoration works. The rotating cake stand / turntable can also be used during cake cutting functions / ceremony which will give a nice look to your guests. Ideal for Borders, Icing, Combing, Leveling. 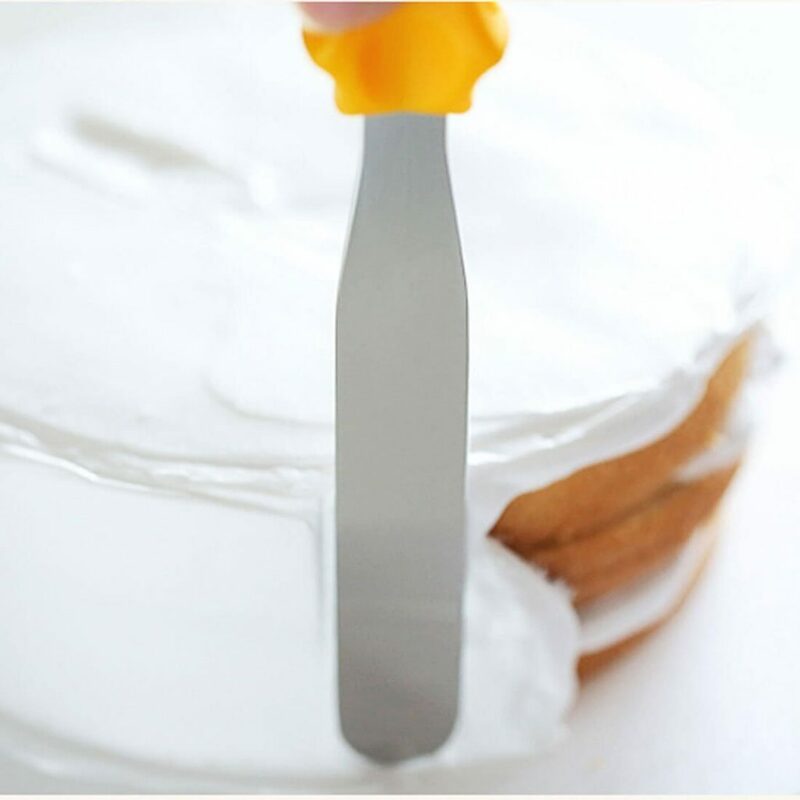 A cake leveler is used for cutting the cake into 2-3 layers. It’s also an important tool for decorating cakes. Can be used for cutting cakes up to 10 inches wide. Cake leveler would make the cake top perfect level for precise decorating. Cut the cake to perfect shape before icing the cakes. Spatulas are needed for applying the frosting on the cakes. They are also needed for cleaning and spreading frostings on a cake. These are special spatulas, made for the purpose of decorating cakes. 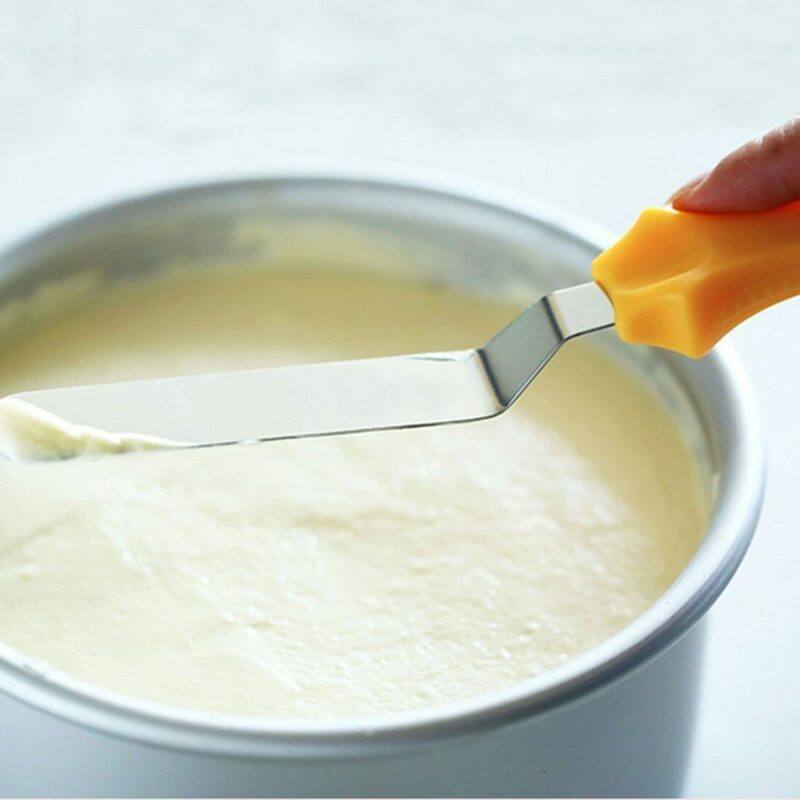 Perfect for spreading icing, cream and butter icing into cakes. With a cranked tempered stainless steel paddle at the perfect angle and the angle feels just right. This spatula helps you to achieve a much smoother surface. 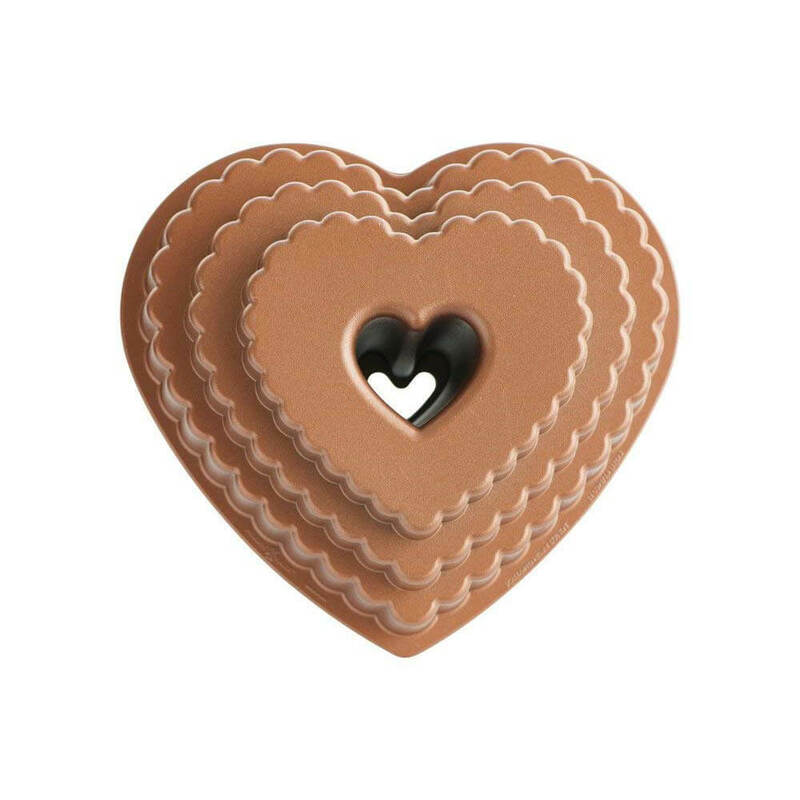 A cookie / biscuit mold press is used for baking beautiful cookies. This cookie/biscuits mold includes : Cookie press machine; 20 different flower pattern pieces; 4 different mounted flower mouth. Such a cookie biscuit mold press enables you to quickly and easily produce a variety of attractively shaped biscuits. It’s made of aluminum material. I personalty feel this is a nice gift – It’s practical, budget friendly and useful. Nozzles And Piping Bag Will Allow You To Beautifully Decorate In Rose Petal, Swirled Shell -Type Icing Rosette-Piped Leaf Heart Flower Royal Icing On Cakes & Cupcakes Mousse Fondant With Sugar Crafts Sugar Paste Plungers Cutters Textured Ruffles With A Smooth Move. Create Impressive Desserts – These Pastry Nozzles Are Ideal For Cake, Cupcake, Tarts, Desserts, Pastries And Cookie Decoration! With such an Icing Kit, Your Amazing Cake Will Impress All Your Guests. This is a perfect gift for those who likes creating beautiful designs on cakes. There are a total of 52 nozzles. Theese nozzles can be used in a number of ways for cake decoration. Baker loves sprinkles. They can be sprinkled on top of cake. You can also cover the entire cake in sprinkles. They can be sprinkled on top of cupcakes. Sprinkles come in different shape, size and colors. This set would be the perfect gift for the person who uses fondant for decorating cakes. The set contains 14 items in total. Create professional looking flowers and designs. The baker can roll/cut/shape the fondant using these different tools. Flowers, snow flakes, leaves, petals, etc, can be created using these. Using the roller and the yellow white colored fondant tools, the person can create any object she wants to decorate the cake with. Books are an amazing gift option. They are probably the best gift for those who love reading. Similarly cookbooks are a great gift option for those who love cooking. Baking cookbooks can be gifted to both – Beginner baker as well as experienced baker. Here is a collection of classic baking cookbooks. These baking cookbooks have been appreciated by bakers from all around the world. They are a great source of knowledge for the baker. Some of these are related to baking basics. Some of these are recipe cookbook. Martha Stewart is a popular name in the cooking/baking world. 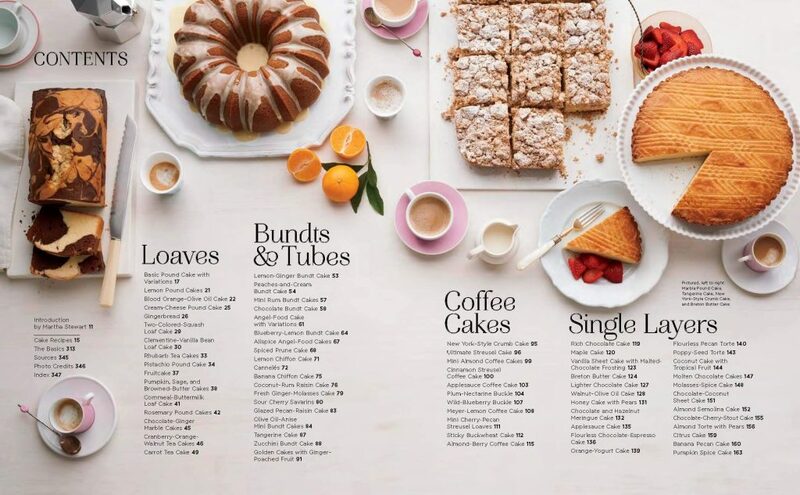 This book of hers is a classic baking cookbook.A one-stop resource for cakes–birthday, chocolate, coffee, Bundt, upside-down, loaf, and more. From pound cake and angel food (with many variations) to genoise and streusel-topped, from comfort classics like red velvet, six-layer coconut, rich chocolate, lemon meringue, and cheesecake to sophisticated grown-up fare including chiffon cakes and tortes with luscious fruits, these 150 recipes and color photographs cover techniques, decorating, and gifting ideas for every taste and occasion, whether no-fuss or fancy. The person who would receive this baking cookbook would like this gift for sure. 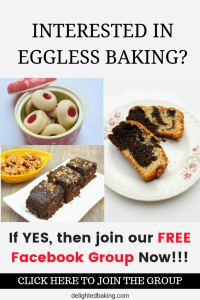 If the person likes baking eggless cakes, cookies, muffins etc. then you can gift this baking cookbook. Author Nita Mehta, Indian celebrity chef, has written this amazing recipe book to show people certain ways in which one can prepare amazing bakery goods like professional chefs. The recipes included in the book do not contain eggs. Instead egg substitutes are used to create some of the eye-catching and palatable cake, muffins and pastries. Martha Day has compiled this comprehensive collection of recipes. A contributor to many publications and magazines, she is a keen home cook. The book contains 400 recipes – Breads, Cakes, Pies, Tarts, Cookies etc. This is a great gift for every level of baker. Baking is both an art and a science, and mastery in baking allows the baker to be creative in exploring new and quality products from inconsistent ingredients and process conditions. This book, now in its second edition, gives a succinct account of the practical and theoretical concepts, the methods and processes involved in the preparation of various bakery products and The author, with her rich teaching and industry experience in the field, gives a wealth of information about making of various yeast-made products-bread, cakes, biscuits, desserts and pizza their ingredients, leavening agents, and the functions of salt, sugar, eggs and so on in bakery production. She also discusses the use of modern technology machines in bakery production, icings, decoration, bakery organization and many other aspects and this revised edition updates and simplifies the existing text in a number of places and also includes a large number of colour photos of finished products and ingredients, which will provide the readers with clear knowledge about them. 6 continents, 52 countries, 80 cakes. Top pastry chef Claire Clark explores six continents of cake culture in this treasury of adventurous baked delights. Discover the cakes most loved around the world. This is a fabulous gift for bakers. Cakes And Bakes is a delectable recipe book authored by India’s leading chef, Sanjeev Kapoor. Through this book, readers can enhance their baking skills by following his simple, yet spectacular recipes. All the recipes are mentioned in an organised manner, with easy-to-follow step-wise instructions. Through this book, one can learn how to make sweet delicacies like black forest gateau, sacher torte, mississippi mud pie, and even savory baked items like mushroom quiche and spring onion tarts. Additionally, teatime snacks such as cheese balls, a variety of breads and rolls, and so on are also provided in the book. A few exclusive eggless recipes are also provided, but mostly all the recipes contain egg. In addition to the author’s time and tested recipes, he also provides useful information, tips and techniques to help de-mystify the art of baking and make it accessible to all. Featuring a mouthwatering selection of cookies, cookie bars, cookie dough dips, slice-and-bakes, no-bakes, and more, Sally’s Cookie Addiction features dozens of exciting flavors, including chocolate, butterscotch, peanut butter, sugar, coconut, lemon, s’more, and oatmeal, oh my! Complete with tips on how to bake the perfect cookie and gorgeous photography, Sally’s Cookie Addiction is the only cookie book you need on your shelf. Prepare for your kitchen to be the most popular room in the house while the smells of Warm Chocolate Chunk Skillet Cookies, Lemon Crème Sandwich Cookies, and Soft-Baked Sugar Cookie Bars emanate from the oven! This baking cookbook is a great gift option for those bakers who love baking cookies. This book is a good gift option for the baker who bakes eggless breads and buns. A collection of veg breads and buns recipes. With over 140 easy-to-follow recipes, Home Baking caters to your every baking need. A great gift option for those who love Rachel Allen’s recipes. With step-by-step photography,this book contains key pastry techniques and more than 60 beautifully illustrated recipes. This book will become an invaluable source of inspiration and a constant reference for all your favorite French-inspired sweet treats. There are chapters on Basic Techniques, Pâtisserie, Tarts, Petits Fours, Gâteaux & Desserts, and Bakery & Viennoiserie, and you’ll find recipes like chocolate and coffee éclairs, lemon tart, honey madeleines, brioche, macarons and red berry charlotte. 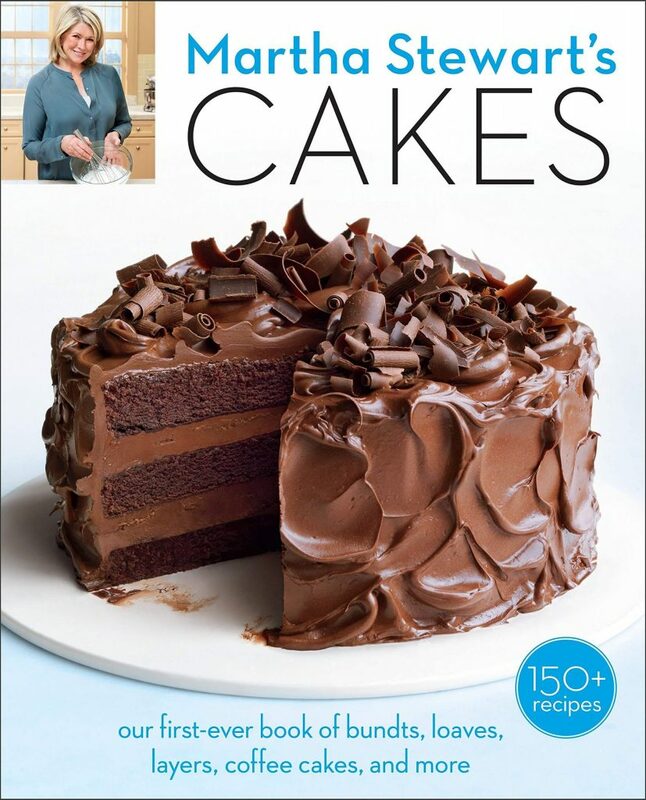 In her first cookbook, Candace opens up her recipe vault to bring you 100 irresistible desserts . You’ll learn all the secrets for making 50 beloved Sprinkles Cupcakes, from iconic red velvet to new flavors created exclusively for the book, like crème brûlée. But Candace doesn’t stop there. 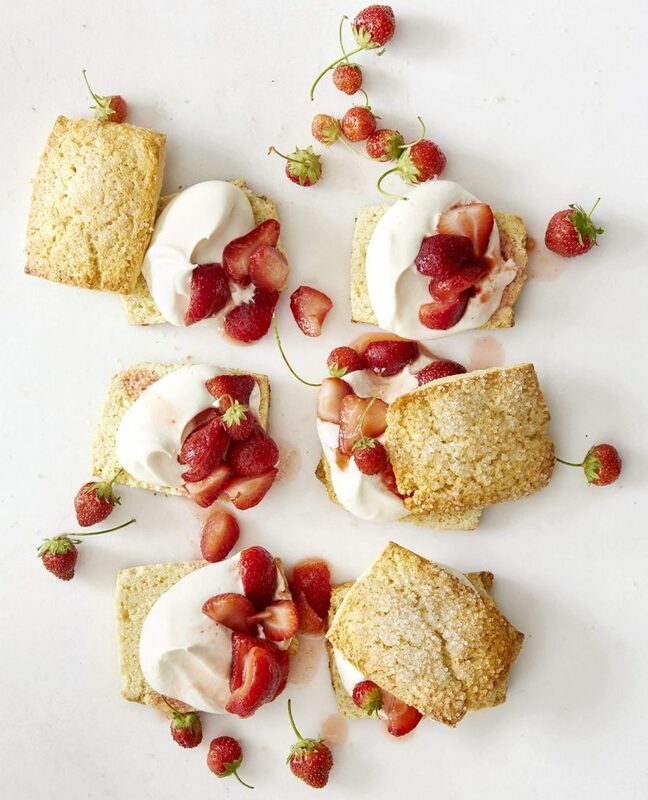 She shares the recipes for her all-time favorite cakes, pies, quick breads, cookies, bars, and other treats, plus delicious guest recipes from Sprinkles friends like Reese Witherspoon, Julia Roberts, and Michael Strahan. 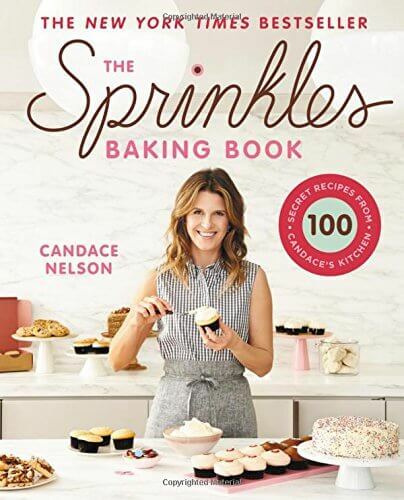 THE SPRINKLES BAKING BOOK is filled with all-American classics that will appeal to everyone in your family and on your dinner party guest list. Complete with over 75 brand new recipes, indulge in truffles, fudge, caramels, and marshmallows. And if you like Oreos, Reese’s, Snickers, or other candy bar favorites, Sally will show you the best ways to incorporate these into cookies, cupcakes, bars, and more. Complete with easy-to-follow, step-by-step recipes, Sally’s signature photography for every recipe, and snippets from Sally’s own kitchen experiences, Sally’s Candy Addiction has a recipe for every person who loves candy! Again a good gift option if the baker likes baking sweet treats. This book has received 4 stars on Amazon and I am sure the person would love this baking cookbook as a gift. If the baker is interested in baking eggless cupcakes, then this is a good gift option. Nita Mehta is a famous Indian chef and author and shares some of the nice eggless cupcakes recipes in this baking cookbook. This is an irresistible collection of bread recipes from around the world, made both by hand and in a bread machine, shown in 500 tempting photographs. You can explore the diversity of bread in fabulous recipes such as Ciabatta, Golden Pumpkin Bread, Spinach and Parmesan Bloomer, Parathas, Navajo Fried Bread, Mango Teabread and Cappuccino Chocolate Panettone. It features delicious breads from all over the world, including France, Germany, America, India and Mexico. Recipes include loaves and wholegrain breads; flatbreads and pizzas, rolls, buns and pastries; and dessert breads, tea breads, puddings and cakes. There is something special about the aroma and taste of freshly baked bread, and this book celebrates bread in all its diversity, whether made by hand or in a bread machine. It contains all the popular classics such as White Bread, Rye Bread, Soda Bread, Sourdough and Corn Bread, as well as more unusual breads such as Harvest Festival Sheaf, Hazelnut and Fig Bread, and Red Lentil Dosas. There are also plenty of teatime treats, such as Banana Bread, Bilberry Tea Bread, Lemon and Macadamia Bread and Peach Brandy Babas. So these are some of the best gifts for those who love baking. I hope you get a nice gift among these. This collection is divided into 4 sections so that you can easily search for the gift of your choice.